The need to convey letters of an alphabet verbally is a common occurrence. You are on the phone and need to spell a name, car registration number or email address. If you are an English speaker, you will probably be struggling with phases like “‘d’ for ‘dog'” or “‘f’ for ‘Fred'”. You may just choose to sound the letters directly as ‘de’, ‘ef’, etc. and hope they will be received correctly. With today’s modern, and generally high quality, voice networks this strategy is often successful but occasionally there are misheard letters and you are back to finding a word that represents them or repeating them more slowing and distinctly. The problem occurs in all languages but this blog will focus on English. However, the principles should be easily transferred to other languages. How to reliably transmit data over a noisy channel is a well known and much studied problem. The general approach is to include additional information with the original data. This additional or redundant information is used to recover the original data should it be affected during transmission. The trade-off is this additional information makes the transmission longer. So the challenge is to formulate this additional information in a ways that keep the transmission as short as possible but provides the best chance to recover the data should it become corrupted. In the digital domain this comes under the study of Coding Theory. The first for these is accommodated by using well known common words, the second by treating the first letter of the word as the representative letter and the last two are the main design challenge. Obviously using say, “pat” for “p” and “bat” for “b” is not particularly effective as “pat” and “bat” might themselves be confused. Whereas, for example, “pen” and “bat” seem to be more distinct. Using long words would make the distinction even greater, for example, “banana” and “pendulum”, however these take longer to say and hence slow down the transmission process. So there is a trade-off between speed and accuracy. International Spelling Alphabet (ISA), also known as the NATO Phonetic Alphabet, is widely used in aviation, military and other areas where accurate letter transmission is critical. Most people are familiar with it, even if they don’t remember all the words. It was developed in the 1950’s and hasn’t changed since. Note the deliberate misspelling of alfa (alpha) and juliett (juliet/juliette) to help clarify pronunciation for non-native English speakers. We used these to read out hexadecimal character strings, which are conventionally represented by the sixteen characters 0-9, A-F. This worked well as they are quite short, easy to say and fairly distinct. As will be seen each of these steps involve some unique challenges. Just selecting a pool of suitable words for the first step is more involved than you might expect. The second step requires a dictionary with phonetic representation of the words. As mentioned, this blog is primarily focussed on English. But as any English speaker knows there are many dialects of English each with their particular pronunciation. So the phonetic dictionary used will influence the outcome, but in most cases this shouldn’t be a major issue. Of course the same approach could be used for any language which has a suitable phonetic dictionary. Linguistics and its sub-field, phonology, are very mature subjects that have been extensively research and studied. The whole area has been re-examined and revised by the development of speech recognition technology that has introduce powerful mathematical tools and computing techniques that have further enhanced the field. So what follows should be seen, at best, as a simplification and generalisation of a much deeper and more complex discipline. Having said that, the use of convolution, a signal processing technique, to determine the phonetic distance between words (which accommodates phoneme duration) could be of some interest to the reader. Finally, please note I’m not a professional linguist so don’t take the following as definitive. Carnegie Mellon University (CMU) has developed a large open source Pronouncing Dictionary. It has over 130,000 words presented in a format that is easy to process. It uses the ARPAbet phonetics set, which is based on US English, rather than the more general International Phonetic Alphabet but there are conversion tables between the two systems. This post will use the CMU dictionary as its phonetic base. It is biased to US English pronunciation (not ideal for the Queen’s English purists:) but as we are only considering relative phonetic distances it shouldn’t be a significant issue. The English language uses around 40 separate sounds or phonemes. They are divided into two main categories – consonants and vowels. Each word is on a separate line and comment lines begin with a semicolon (;). To get a feel for the number and distribution of phonemes, Table 1 below shows phoneme counts and percentages, split by phoneme type–consonant (con) or vowel (vow)–and ordered by frequency (high to low) for the entire CMU dictionary. Note the vowel stress number has been ignored, that is, the vowel counts are the sum of the three different stress values for each vowel. We can see there are 39 phonemes in total – 24 consonants and 15 vowels. The most commonly used consonant is N as in “night” and the most common vowel is AH as in “duck”. The full table of CMU phonemes and examples of their use is shown in Table 2 below. This suggests treating the phoneme sequence as more of a signal. This coincides with the brain processes the sound of a word. Convolution is a common technique in signal processing and can be adapted here to provide an alternative way to define the distance between the two sequences. The basic idea is to ‘slide’ the two sequences over one another and to calculate a distance value based on the sum of the ‘distance’ between orthogonal pairs of phonemes. The minimum value become the distance for the sequences. where d(x,y) = distance between two individual phonemes and ‘–’ represents a null (or missing) phoneme. For brevity, the remaining convolution matches are not shown. So we need k greater than or equal to 0.5 and less than 1.0. We can take the middle ground and define k = d(–,x) = d(x,–) = 0.75. Table 3 below summarises the distances for combinations of phoneme pairs where c1 and c2 are consonants, and v1 and v2 are vowels. For completeness, the distance between two nulls, d(–,–), is defined as zero, however, as this situation never arises in this analysis it is irrelevant. To achieve this we will first develop a relative distance measure for pairs of consonants, and pairs of vowels, that comply with the distance function conditions. Their numeric values will then be uniformly adjusted so they have a range between 0 and 1, and have a mean of 0.5. Determining the relative distance between two consonants or two vowels is somewhat subjective. There is research that actual attempts to measure this directly through experimentation, for example Patterns of English phoneme confusions by native and non-native listeners – Cutler, Weber, Smits and Cooper 2004. There are also many reference to metrics or features associated with consonants and vowels. For consonants it is common to associate them with various phonetic articulation features. For vowels it is usual to consider tongue position and lip roundness. For this analysis we are going to use consonant features and vowel metrics to infer a numeric distance. For consonants, we assume the more features they have in common the closer they are, and conversely, the fewer features they share the further they are apart. For vowels, we will assume the more similar their tongue position and roundness, the closer they are. There are various ways to turn this feature table into a distance measure but to maintain our distance analogy we will treat each feature as a dimension in a multi-dimensional space. A consonant’s coordinates in this space are set to one or zero depending on whether the consonant possesses that feature or not. We can scale each dimension by applying a weight or scaling factor. This provides a way to vary the relative importance of each feature and tune the distance values. Note scaling individual dimensions does not invalidate the distance conditions discussed above. Table 6 can be downloaded in csv form here. There is no exact value for these and they typically vary with different dialects. Here we will assign a value between zero and one for each metric for each vowel based on various vowel charts (see Table 7 below). Pure vowels (monophthongs) are similar to consonants in that they have a single set of metric values. In contracts, diphthongs are a combination of two vowel sounds. They commence at one sound and end on another. Monophthongs can be thought of as points in the metric space, whereas diphthongs are line segments. Some of the diphthong starting and ending points are existing monophthongs but others are separate points not corresponding with any existing monophthong. A natural way to handle diphthongs is to treat them as a straight line trajectory from the first vowel to the second vowel. This makes them a straight line segment in the metric space. To incorporate diphthongs into the vowel distance table we determine the average distance from a monophthong point to a diphthong line segment or the average distance from a diphthong line segment to another diphthong line segment. These averages can be calculated either numerically, by assigning a (large) number of points over the line segment, or segments, calculating the distance to each point and averaging the result, or analytically, by defining the distance in terms of a variable and integrating (see Appendix B for details). Table 10 can be downloaded in csv form here. 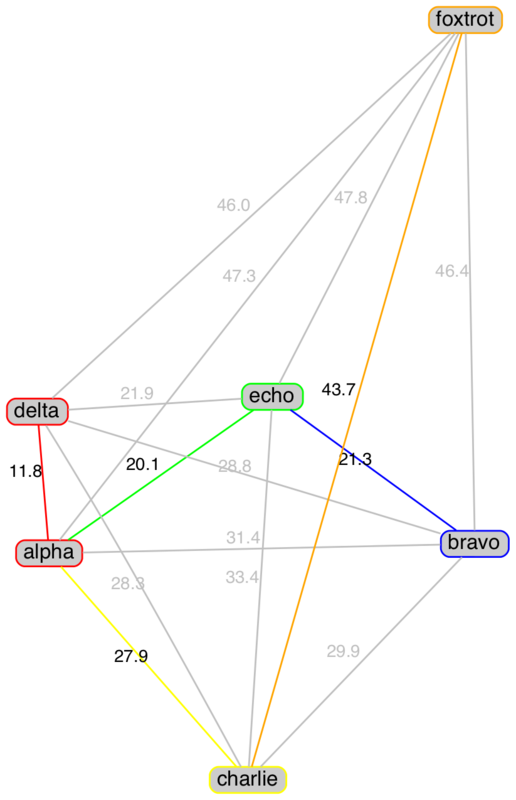 By their nature phonemes vary in duration. Their duration can be determined from experimental data. The duration times in Table 11 below are based data from Andras Kornai’s FORMAL PHONOLOGY. For our purposes the duration times, measured in milliseconds, need to be converted into a number of repeated phonemes that reflect these times. Somewhat arbitrarily, a range from 5 to 15 repeats has been selected and the durations time have been “compressed” into this range to determine the repeats associated with each phoneme. Vowels have three values for the three stress cases (p = Primary, s = Secondary and n = No stress). These were determined by making the the primary stress 20% greater, and no stress 20% less, than the secondary stress which took its base duration from the above reference. Repeats have been rounded to the nearest integer. One further refinement is to increase the duration of the final phoneme of a word if it is a vowel. There is a tendency to linger on the final vowel sound especially when the word is said in isolation. For example, consider the length of the “o” when saying “echo chamber” versus “echo” by itself. To accommodate this phenomenon the repeats of a final vowel are increased by 20%. This will produce a raw distance value. As a simple example consider the distance between “cat” and “mouse”. The raw phonetic distance is not that useful as it is always possible to increase it by using longer words with more phonemes. The distance per phoneme is a more useful measure as it focuses on the distance between the phonemes themselves by discounting the length of the words. However, for our purposes, we want to go one step further by imposing a cost on the length of words. That is, we want the greatest distance for the shortest words. So we can define a relative phonetic distance between two words (w1 and w2) as the raw phonetic distance divided by the average number of phonemes raise to some power λ (lambda for length sensitivity). Note when λ = 0, rel-dist = raw-dist, and when λ = 1, rel-dist = raw-dist / avg-ph-cnt = raw-dist per phoneme. For high values of λ the relative distance is increasingly penalised (reduced) by the length of the words. This gives us a way to tune the relative distance to reflect how expensive word length is to the outcome. To see how these measures work in practice, consider the following example comparing the relative phonetic distances between the word ‘cat’ and some other sample words. The number of phonemes in each word is shown in parentheses () after the word. The numbers in brackets  after the distances are their order, or rank, (1=largest, 2=next largest, etc) within the column. Relative distances place more emphasis on word lengths as λ increases. For example, “dog” goes from rank 4 to rank 1, and, “university” goes from rank 1 to rank 5 as λ increases from 0 to 3. 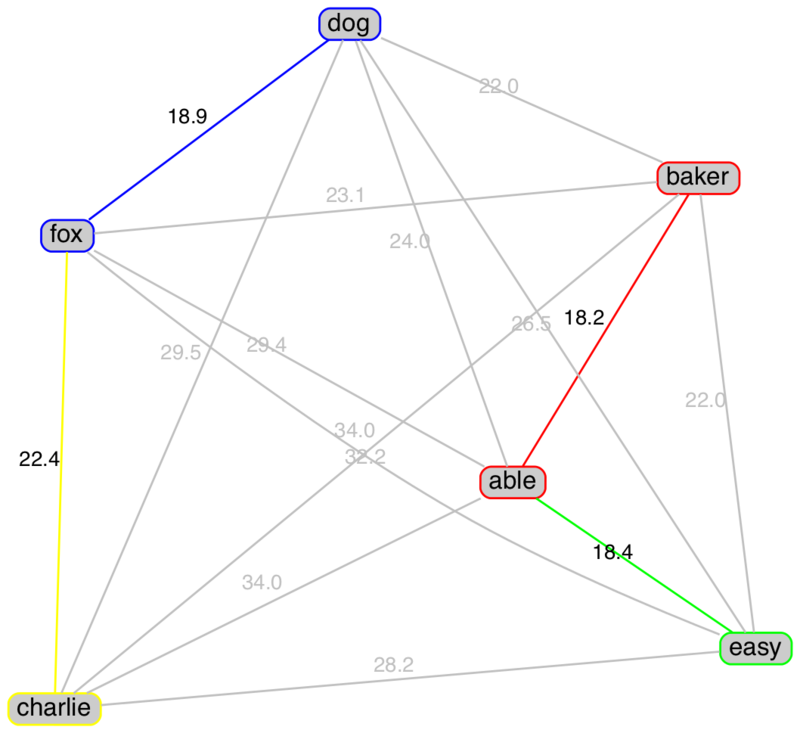 Another way to view this is to plot the relative distance of each word from “cat” (excluding “cat” itself) against λ. 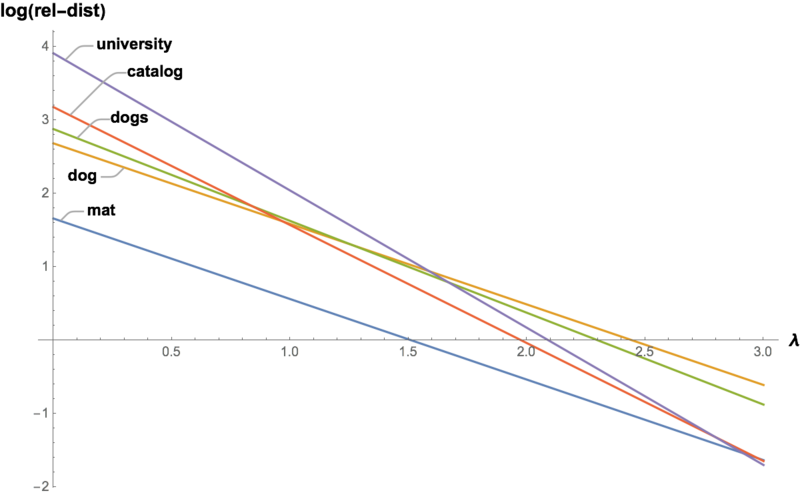 The plot in Figure 1 below uses a log scale to improve clarity. It shows how the longer words start with larger values but reduce more quickly as λ increases. Note also that words with the same phoneme count, such as “mat” and “dog” maintain their relative difference regardless of the value of λ. We can extend these ideas to groups of words instead of just pairs. The first is the basis of the work above. We have implicitly assumed that the more differences in consonant features, vowel metrics and duration between words, the less likely the words will be confused. We can partly confirm this by our own experiences and partly by common sense. In reality, it is likely the degree of confusion between words is more nuanced, and shrouded in how our brains process and recognise sounds. However, for our purposes, the approach taken will have to suffice. The second assumption is more straightforward. Although there are differences in the duration of individual phonemes, these tend to average out within a words. Further the transition between each phoneme also affects the duration of pronouncing the word. So the number of phonemes in a word is a reasonable measure of the cost associated with its reproduction. Armed with these two assumptions, we can perform a cost/benefit analysis on groups of words. The cost is associated with the phoneme counts of the words, while the benefit is the phonetic separation achieved between them. As a concrete example, let’s return to the six words used to represent the hexadecimal characters (A-F) discussed earlier. The two tables below show the raw distance, and relative distance (λ=2), in parentheses, for each hexadecimal word pairings for the ISA and USPA abbreviations respectively. The question is how best to compare these two schemes and, indeed, schemes in general? As suggested above, we want to maximise the benefit/cost ratio (or minimise the cost/benefit ratio) where benefit is some function of distance and cost some function of the number of phonemes. We also may want to consider the frequency or probability of words, that is, how often a word (or its associated letter) occurs. For hexadecimals, and many other real life scenarios (e.g call signs), this is expected to be approximately the same for each letter/word. But in some contexts, particular letter/words may be used more frequently than others. Let’s start with the cost side of the equation. As we are assuming the cost is proportional to the number of phonemes in the word, the cost of saying the entire set of words is the sum of the probability (p) multiplied by the phoneme count (c) of each word. However, for our purposes we will stick to the simple arithmetic mean of the phoneme counts. Now let’s consider the benefit side of the equation for a group of words. If there are n words in the group, each word has n-1 neighbours and n-1 corresponding distances to them. So there is a total of n(n-1)/2 distances between the n words. To simplify matters, we will focus on the distance between a word and its nearest neighbour. This is the minimum distance associate with each word. It can be interpreted as a measure of the likelihood the word will be confused with another. It also means we only need to consider n distances for the benefit equation. Figure 2 below shows graphs of the ISA and USPA words (nodes) with the links (edges) between them representing the raw distance from the table above. The minimum distance edges for each word are coloured along with their associated nodes (not to scale). It can be seen that the minimum minimum distance (red edge) is always shared between two nodes. While other nodes can either share or have their own minimum distance. The result of this approach is that each letter/word is assigned a single distance value representing its worst case separation denoted d.
We can treat this minimum distance in a similar way to the cost phoneme count. Again the probability of the word being used can be similarly accommodated. Of course there a many other ways the cost and benefit equations could be formulated. There is no “correct” approach, but each should provide similar general results–reducing the cost for shorter words and increasing the benefit for greater separation–with only the quantum varying. The first (qual0) is just the average minimum distance. It takes no account of the length of the words. Some constraint on the word length can be externally imposed by limiting the length of the candidate words available for selection. The second (qual1) is the average minimum distance per phoneme. It takes basic account of the word length meaning longer words are not necessarily better than shorter ones but it places no particular penalty on longer words. The last (qual2) places more emphasis on word length by penalising longer words. This is the most useful for our purposes as it represents the most economic measure. These results show that while the average minimum distance (qual0) for ISA are greater than USPA, USPA improves as λ increases because its average phoneme count is significantly smaller. These figures suggest that for hexadecimal words, at least, USPA is a significantly more economic scheme (by about 44%). We will look at some alternative hexadecimal schemes later that have even better economy. Before we can create new schemes, however, we need a source of candidate words. To achieve the second condition, an acceptable first phoneme (or phonemes) is assigned for each letter. The following table show the proposed phoneme mapping. The letter X is a special case, as it invariably sounds like Z when used at the start of a word (e.g. xenon, xerox and xylophone). The one notable exception is x-ray which perforce will be used for the letter X. Place names such as countries, cities, rivers, etc. This list is probably not exhaustive, in short, there are many and varied reasons to exclude words. Perhaps it is easier to define acceptable words as: common simple root words with a neutral or positive character that are unlikely to be offensive or symbolic to most people. Consideration as to how the words will be used is also important. If they are for ad hoc use, in casual situations without a prior formal agreement, common and familiar words will be more effective. However, if the scheme is going to be used by a formal agreement between parties (e.g. ISA), it is more acceptable to use less common words as they will be familiar and expected by the parties involved. Indeed, somewhat obscure words may even be preferred as they are more readily recognisable as letter substitutes. The CMU dictionary is full of words that would be caught in the unsuitable categories above. In particular, it has a large number of abbreviations, proper nouns and derivations. So as a more concise and manageable source of words we will use Google 10,000 most common English words as a base source. Of course the Google words also contain many words that fall into the undesirable categories above. As a result, a number of words have been excluded from the Google set to produce a subset for use in the examples below. Can we find alternative hexadecimal word sets to ISA and USPA that produce a higher quality result? A simple approach would be to try every combination of the words representing the letters A-F and select the combination with the highest quality score. A little thought will reveal this has complexity scaling problems. If we assume about 10,000 / 26 (approx. 385) words per letter, there will be around 3856 or 3.25 x 1015 word combinations to analyse. Searching this entire solution space is problematic even with a fast computer and would be impossible with larger word groups like A-Z for the full alphabet. Select a word at random for each letter from the word candidates. Order the words from smallest to largest based on their minimum distance (i.e. distance to their nearest neighbour). When this is equal (which always occurs at least once) order by the number of candidate words available, least to most. So select the word with the closest neighbour and least number of alternative words first. For the selected word, try replacing it with each of the available alternative words from the candidate words. Calculate the resulting quality measure for the new word set and select the best alternative word based on this measure, or leave the current word if no improved word can be found. Repeat the above step for each word in turn. If there are no improvement found for any word finish, otherwise loop back to Step 2. This is a simple form of gradient accent where each dimension (letter/word) is examined in turn for “higher ground”. Once no further improvement can be found we have reached a local maximum. By repeating the process for different random starting points we can search for better local maximums. Some results from applying this approach to candidate words restricted to 3-5 phonemes using our three quality measures above (qual0, qual1 and qual2) are shown below in Tables 17, 18 and 19 respectively. The Hex35-λ0 solution optimises for qual0 where word length is ignored, so it only requires maximising the distance between words. Hence the result uses the longest words available – in this case five phonemes. The Hex35-λ1 solution optimises for qual1, where the distance per phoneme is important, so the word length is essentially irrelevant. As a result we see a variety of word lengths. Finally for the Hex35-λ2 solution which optimises for qual2, the word length penalises the result more and the solution favours words with the smallest phoneme count (while still trying to maximise separation distances). Table 20 below compares these three local maximum solutions with the ISA and USPA schemes. We can see that the generated solutions deliver significantly better results in their quality category (highlighted cells) than either ISA or USPA. It also highlights that the solution produced using the local maximum procedure above is not necessarily the true maximum solution. The Hex35-λ2 word set is actually a better solution than the Hex35-λ1 word set for the qual1 measure. So Hex35-λ1 is clearly sub-optimal. Finally, as a baseline of sorts, let’s include a random sample of words with 3-5 phoneme counts. Table 21 below includes the average results (rand-35) of 1000 words sets drawn randomly from the same 3-5 phoneme word pool used by the local maximum solutions. It is interesting to note that for the six hexadecimal letters, ISA scores worse than a random sample on two of the three quality measures. USPA is marginally better on all three. All the constructed word sets score significantly better than the random samples for their optimised measure, and indeed better for the other measures as well. The methods used above can be extended to the entire 26 letters of the English alphabet. First lets compare the full ISA and USPA schemes with the average of 1000 random samples take from the 3-5 phoneme word pool in the same way we did for the hexadecimal case. The ISA scheme results are better here than the hexadecimal case for qual0 and qual1 against both USPA and the random samples. However for qual2 it falls below both. This reflects the significantly longer words used in ISA, averaging 4.96 phonemes compared with USPA’s 3.81 and 4.02 for the random samples. 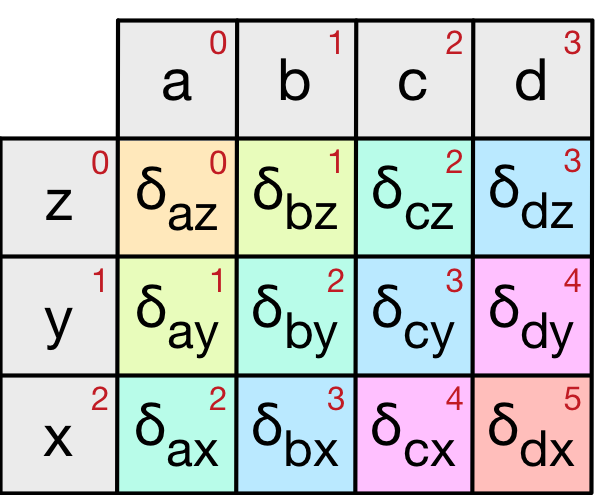 The same local maximum approach used for hexadecimal words above can be applied to the entire alphabet (A-Z). It produces a wider variety of possible solutions. Most have a mixture of “good” and “not-so-good” words based the categories above. One of the main issues is whether to include personal names (e.g. John, Kate, Howard, etc.). The upside is that names provide a richer set of phoneme combinations and increase the available word pool. The down side is that names are not standard english (i.e. not generally found in dictionaries) and some are more familiar than others to the general population. I’ve chosen to include them in this case. Table 23 below shows two examples of local maximums for each of our three quality measures (labelled -a and -b). All words are again drawn from the 3-5 phoneme word pool. Clearly it is possible to find word sets that achieve better results than both ISA and USPA using the distance measures defined in this blog. In fact, the problem is choosing between the large number of good solutions available. Appendix D lists some high scoring word sets using different criteria for candidate word pools and quality measures. I’ll leave it to the reader to choose their favourite. An attempt to systematically address each of these is included in this blog. Perhaps the most innovative element is the use of discrete convolution to measure the phonetic distance between two words. This allows different phoneme durations to be accommodated in a natural way. How well the word differences, determined by this convolution, compare with actual human perception is an open question. However it does provide a robust quantitative comparison method. The analysis does suggest that ISA is far from optimal based on the presented measures. Even without this analysis its strange preference for words ending with AH (6 instances) and OW (5 instances) phonemes is a sign that improvement is possible. Of course its near universal adoption makes any change all but impossible. However for informal use, readers could select any of the options in Appendix D and be confident that there is at least some science behind their choice. Firstly note that the entire space can be scaled by a single factor, k, to expand or contract it. This factor can thus be used to achieve either condition 2, by scaling the maximum distance to 1.0, or, condition 3, by scaling the average to be 0.5, but not both. To achieve both we need to apply a non-linear monotonic function to the weights. Here we choose to raise them to a power r.
Now, by inspection of the maximum distance, r can be adjusted to move it towards its target value of 1.0. Repeated iterations using a binary search (chop) approach allows r to be determined to any appropriate level of accuracy. Once r is determined, k is known and the final weights can be calculated. This approach may not be the most efficient but as it only needs to be carried out once it is not that critical. The distance between a point and a line segment can be calculated numerically or analytically. Numeric approach provides an approximation by dividing the line segments into a number of equally spaced points and taking the average of the distances from the point to the line segment sub-points. Increasing the number of sub-points improves the accuracy of the result. The analytical solution proves to be a bit trickier than one might expect. One approach is given below although alternative solutions that are more straightforward may be possible. Consider four points P, Q, R and S in ℝn and their corresponding vectors p, q, r and s. R and S are the start and end of a line segment. Q is a point on the line segment and P is the reference point. The Euclidean distance between P and Q, or the magnitude of p–q (written p–q) is d as shown in the diagram below. We want the mean (average) distance between P and the line segment RS. Using the parametric definition of Q we have q = r + x(s – r) so that as x ranges from 0 to 1, q ranges from r to s.
Define the distance function, d(x), to be the magnitude of PQ (p–q) for a given x, then the mean distance is the integral of d(x) between 0 and 1. Below we use standard vector dot product algebra to expand d(x) in terms of r, s and p, and then group them in powers of x to form a quadratic equation. The mean distance can thus be calculate by plugging in the values of a, b and c and subtracting the integral’s value at x=0 from its value at x=1. After coding up both approaches, there was good agreement (better than 10-4) between them using 1000 sub-points for the numeric approximation. The approach taken above can be readily applied to the case of the mean distance between two line segments. Consider the following diagram. Line segments TU and RS have parametric points P and Q on them respectively. Their corresponding parametric vectors (p and q) move from T to U and R to S as x varies from 0 to 1. As above, we define the distance d between P and Q in terms of x and integrate over the range 0 to 1 to get the average distance. We can plug these values into the integral above to calculate the result. It is even easier to program if you note that the diagonal cells all have the same index sum value (i.e. the sum of the two corresponding sequence indices). This index value can be used to group the cell results into diagonals for summing. These correspond to the string positions shown below as the two string pass each other. to adjacent values and summing the results." The following are some generated word sets using different criteria for the length of the candidate words (phoneme count) and the quality setting (λ value). The following local maximum word sets use words with exactly four phonemes. Their raw distance (qual0) is shown in brackets. The following local maximum word sets use words with exactly three phonemes. Their raw distance (qual0) is shown in brackets. The following local maximum word sets use words with three or four phonemes. Their qual2 (λ=2) is shown in brackets. The following local maximum word sets use words with four or five phonemes. Their qual1.5 (λ=1.5) is shown in brackets.